Green leader James Shaw was keen on a new refugee category for people adversely affected by climate change, but has no support from Labour and no potential refugees. Create a new humanitarian visa for people displaced by climate change in the Pacific. Climate change will only make the global refugee crisis worse. We’re committed to providing new homes for some of the people who are forced out of their own communities and countries by rising seas and extreme droughts, particularly in the Pacific. There was no mention of this policy the Labour-Green confidence and supply agreement. A proposed “experimental” visa for climate change refugees is dead in the water, with the idea gaining little traction among Government officials and Pacific leaders. Minister for Climate Change James Shaw announced the Government would consider a special visa for Pacific peoples displaced by climate change in October 2017, after a tribunal rejected refugee status for two Tuvalu families. Shaw, who was overseas and unavailable for comment, told RNZ in October the Government would consider an “experimental” humanitarian visa category as “a piece of work that we intend to do in partnership with the Pacific islands”. The families argued rising seas would make their lives unsustainable, but climate change is not a recognised ground for refugee status under the UN Refugee Convention. Minister for Immigration Iain Lees-Galloway said on Friday that Pacific peoples have expressed desire to continue to live in their own countries, and current work is primarily focussed on mitigating the impacts of climate change. Not surprisingly, people prefer that problems are prevented or fixed so they can stay in their own countries. Green Party immigration spokesperson Golriz Ghahraman​ said it was still party policy, but research on the ground showed a visa was likely unsuitable to address climate migration. “The climate migration issue looks like it’s much broader than us coming up with a visa … Tuvaluans want to continue to be Tuvaluans. It looks like the Greens first came up with the policy, then “started looking into it”, research “showed a visa was likely unsuitable to address climate migration” but the climate refugee policy remains. Perhaps the Greens could do some looking into some of their other policies and see whether they stack up. Soooo, The Greens floated an idea, found it didn’t have the support they expected and dropped it. It seems to be far more than “floated an idea” – or can floated ideas become Green policy without any prior research? Do members have any say on ideas that MPs float? The concern is the blind ideology behind such ideas. Just a cursory look around should have told the Greens we have more pressing issues. “Responses to the impacts of climate change would likely be considered as part of future discussions on Pacific immigration policies, but there is no specific plan for an ‘experimental visa’ at this stage.” My bold. Thankfully we havent seen any of the predicted catastrophic circumstances long promised to need such a policy. Many of the fires manmade. What does CPI adjusted mean? 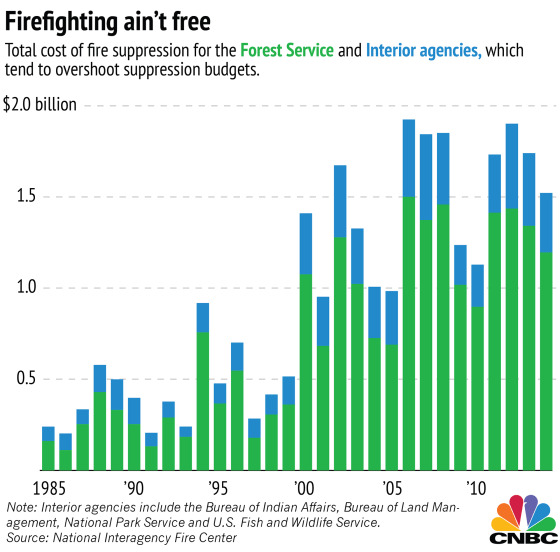 When you are spending more to fight wild fires yet the cost of their damage is increasing as is their size you have a problem. Consumer Price Index the usual measure for inflation . CPI adjusted means you remove the effects of inflation from the data so you can compare the real cost over time . Cool. OK. I now understand what CPI is. However, would you think it fair to have wildfires in this graph given their partial manmade element, as opposed to other weather conditions we have absolutely no control over, like storms and earthquakes? Thankfully we haven’t seen any of the predicted catastrophic circumstances long promised to need such a policy. other weather conditions we have absolutely no control over, like storms and earthquakes? Not even wrong refers to any statement, argument or explanation that can be neither correct nor incorrect, because it fails to meet the criteria by which correctness and incorrectness are determined. As a more formal fallacy, it refers to the fine art of generating an ostensibly “correct” conclusion, but from premises known to be wrong or inapplicable. The phrase implies that not only is someone not making a valid point in a discussion, but they don’t even understand the nature of the discussion itself, or the things that need to be understood in order to participate. Your posted graph in answer to David is incorrect. No conclusions can be drawn ( or tenuous at best) from it with regards to the topic except an increase in billion dollar disasters. Nice bluster with the Wiki link..
1. the weather conditions prevailing in an area in general or over a long period. 2, a region with a particular climate. 3, the prevailing trend of public opinion or of another aspect of life. Does that graph adjust for population growth and the increase in built up areas making the cost of any events higher, no matter the cause? Population and value exposed increases as does the amount of effort to mitigate the risk over time with better building standards , flood works etc . 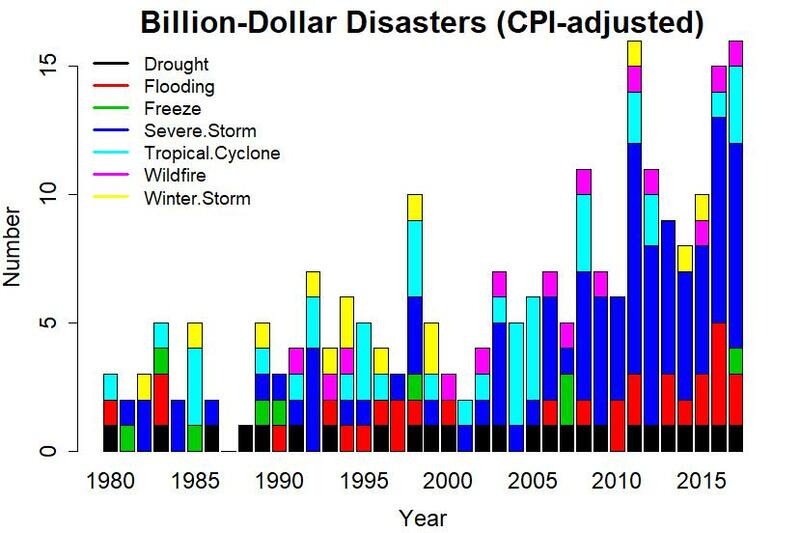 Note how the cost of geophysical disasters is static due to the increase is assets exposed canceling out the efforts to mitigate the risks. Not so with weather related disasters. It needs to be adjusted for all the extra things one can get insured for these days too, perhaps plot it against premium income or re insurance market. Rebuilding a flood damaged 1950s house against a 2015 house, paying out for a rusty old 1970s container ship as opposed to a 2017 colossus. It’s Griff’s turn to be called a prat. Sigh. When you’re losing an argument, call the other person a prat. Or post a puerile Gif. Puerile; a word you learned from me. Verbum excori; don’t overuse it, it suggests a paucity of vocabulary. Er, no. I didn’t learn that word from you. However, there was a word you did use that I had never heard of. It’s good to see you taking my advice and using more appropriate words to match your degrees and education. Take YOUR advice ? You can’t be serious, can think of nobody whose advice would be more useless and unwelcome, especially when it comes to words and language. I don’t take advice from the semi-literate. 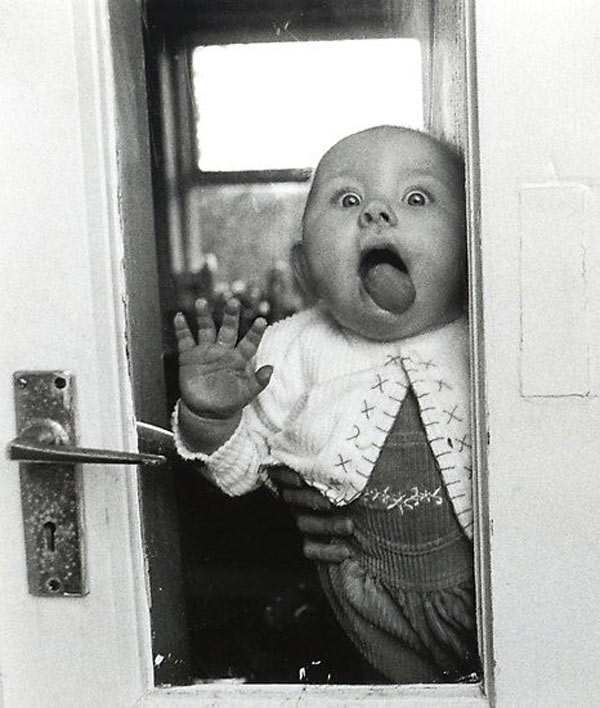 What is the etymological derivation of puerile ? Griff, all that chart shows is that the world is getting a lot richer and has a lot more stuff. “When a “solution” to a problem causes more damage than the problem, policymaking has gone awry. That’s where we often find ourselves with global warming today. Activist organizations like Worldwatch argue that higher temperatures will make more people hungry, so drastic carbon cuts are needed. But a comprehensive new study published in Nature Climate Change led by researchers from the International Institute for Applied Systems Analysis has found that strong global climate action would cause far more hunger and food insecurity than climate change itself. Bjorn lomborg is a proven bullshite artist. The researchers stress that their results should not be used to argue against greenhouse gas emissions reduction efforts. Climate mitigation efforts are vital. Instead, the research shows the importance of “smart”, targeted policy design, particularly in agriculture. When designing climate mitigation policies, policymakers need to scrutinize other factors and development goals more closely, rather than focusing only on the goal of reducing emissions. How utterly surprising bullshiteing Bjorn is using their results to do exactly what the authors caution against in his linked source . Must be a day with a d in it. Try and find something with at lest a small amount of credibility . Hunger and food stability dont really count when you are to poor to afford aircondtioning and you will die in a few hours sitting in the shade in the middle of the day or if your land is under water. I think Bjorn is simply saying the current policies are counterproductive. Which is exactly what the report states. When I read your comment I thought of two names it would probably be written by. Roger A. Pielke Jr or Bjorn Lomborg. I was right it was one of them. The problem with sticking your head in the sand is it solves nothing . Sooner or later you must confront reality as it always bats last. Unfortunately the rest of the world is going to pay the cost of the right wings inability to engage with reality. We have had the last forty years to turn the global economy away from our unfortunate experiment in atmospheric physics . The longer we leave the inevitable the more the disruption will be. You will live to see the result of your denial. Your children and their children will blame you for the world they inherit. Glad you had a good ROFL – it doesn’t seem to take much to get you on the floor. That was a wonderfully worded post that doesn’t speak to my previous post at all. As far as I know BL is a believer in climate change but takes issue with the ham-fisted way it is being dealt with. Seems like a very intelligent view to take to me. Maybe my children and their children will grow up thinking how much better the world could be if proper solutions had been found to the problems facing humanity and prioritisation given to the biggest problems at the time. BL is full of shite. Has been for years . That’s why the AU university’s academics refused to allow the goverment to foist him on them . They did not want to be linked to someone who misrepresents sources to support his ideology. Low to very low cherry picks and misrepresents. There was a lot of politicking in the rescinding of BL’s role at the AU. Does Climate Feedback have a list of credible sceptics, or are all of them misrepresenting cherry picking big oil lobbyists? In 2009, the risk where a collapse in China, a collapse in asset prices and the ‘lack of effective global governance’. In 2007 it was the collapse of ‘global information network’, chronic disease and an oil price shock. 2012-2014 is all about income inequality. It’s just a list of topical worries. 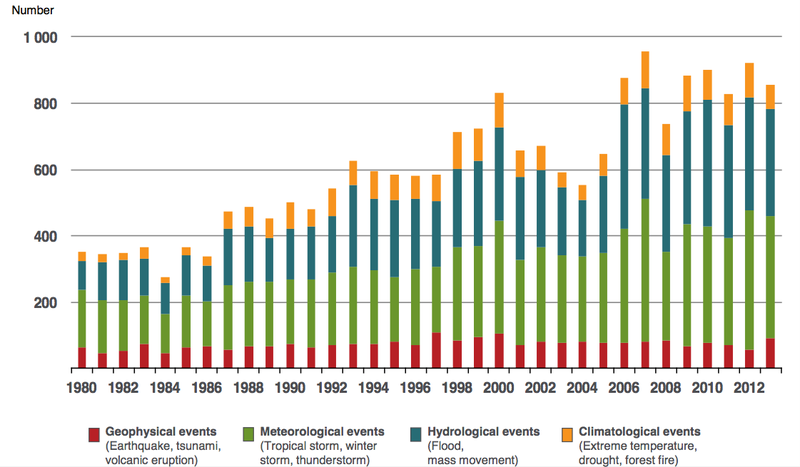 I especially like the way climate change was a major risk in 2011, but had been solved in 2012. So, this how you justify to yourself supporting policies that stave and impoverish people. When a RWNJ shows concern for the poor you know they are full of it . As pointed out lomberg is full of shite . But a comprehensive new study published in Nature Climate Change led by researchers from the International Institute for Applied Systems Analysis has found that strong global climate action would cause far more hunger and food insecurity than climate change itself..
Lombergs linked source on strong climate action. The researchers stress that their results should not be used to argue against greenhouse gas emissions reduction efforts. Climate mitigation efforts are vital. Instead, the research shows the importance of “smart”, targeted policy design, particularly in agriculture. Ummm he misrepresented his source.